We all know fashion is everywhere, but it’s shocking to see fashionable foods. Like outfits, foods can make a statement. The types of foods you eat, restaurants you frequent, and foods you cook can say a lot about your lifestyle. When fashion is literally combined with food, it can be extravagant. This is why it is important to highlight the wonderful artist that put so much time and effort into Fashionable Cakes! The Louis Vuitton Cake is exquisite. The artisans attention to detail is fantastic. There are many VL bags. This one in particular is a popular print for younger women. The colors scream fun and spring. It looks as if her gift is attached to the cake. Though the shoe is not very detailed, it adds balance to the cake. The purse can not stand alone. Without the shoe, the cake looks top heavy. The flowers and boxes add a nice feminine touch to the look. Overall, the cake is appropriate for many ages and shows that the recipient loves the finer things in life. The Designer Cake is appropriate for a woman in her prime because of the label choice and the color scheme. The beige, brown, and white are clean classy colors common in business attire. 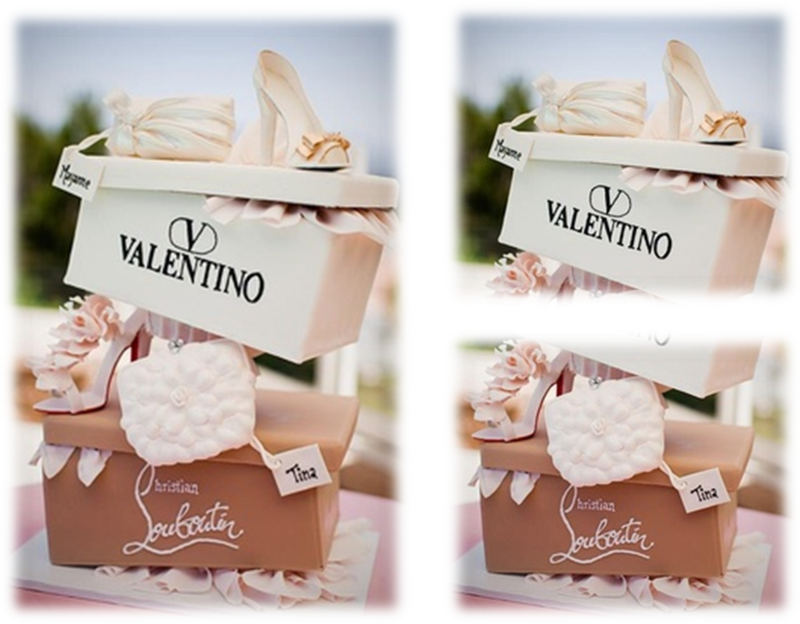 The woman receiving this cake has upgrade from the Louis Vuitton cake. She either wears the brands showcased on a regular bases, or wishes she could. Regardless, the cake is beautifully done. I’m sure Tina was stunned. 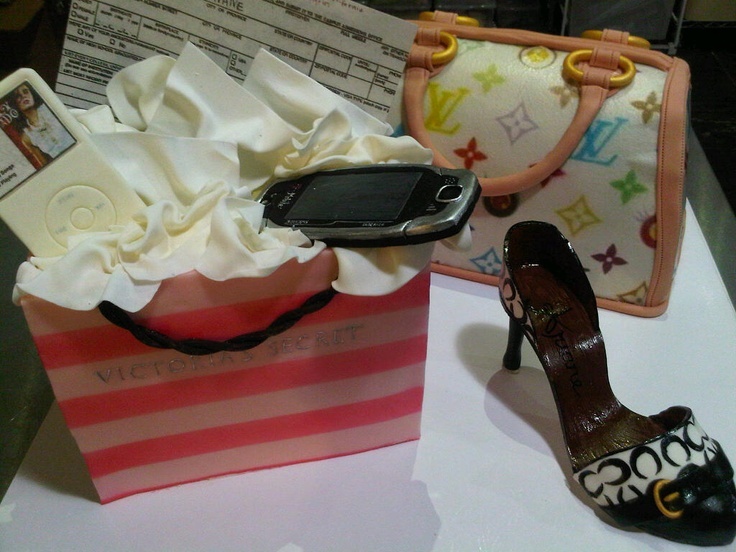 The boxes, handbags, and shoes look like their pilled on top of each other. At a glance, the cake looks real. Cakes of this dimension are not easily executed. The Shopaholic Cake truly embodies the message behind this post. Specific elements from this persons life were used and molded in cake. Without meeting her I know the following: she shops at Victoria Secret, her phone and IPod are always on her, and her bag of choice is Louis Vuitton. Ironically, it looks like the same bag from the Louis Vuitton birthday cake. Though she loves her bag, Chanel is her label of choice for fierce shoes. The purpose behind this cake is unclear. Regardless, the presentation is well done. Anyone receiving this cake would hate to cut it. Like the Shopaholic Cake, the Frequent Flyer Luggage Cake appeals to a woman that travels for work, pleasure, or both. Due to her busy lifestyle, she may not have a lot of time to spend with friends and family. The cake pokes at her busy life and shows the people the she loves that they do think of her often. The magazines can not go unnoticed. Airports carry a wide variety of magazines and books. These were not selected by accident. Due to the shape of the phone, she defiantly owns a smart phone. The remaining details show her favorite necklace, change purse, and lipstick. Though the brands are different, these are clearly her survival travel necessities. These cakes push the baking worlds boundaries. People want to see what artisans are capable of. This is why shows like Cake Boss and DC Cupcakes are able to go strong on TLC. In fact, Buddy of Cake Boss designed cakes for Isaac Mizrahi’s ! Cakes are no longer limited to a few tiers and decorations. Even grocery store bakeries are putting more effort into fashionable cakes. How Can I Update My Wardrobe Without Spending Money?